Mike Caro, born in 1944, has made his mark in the world of poker not by his play necessarily but by his contribution to the ‘science’ aspect of the game. He was nicknamed the “Mad Genius” after he contributed to over 50 charts and graphs in Doyle Brunson’s legendary poker book Super/System (A Course In Power Poker)back in 1978. 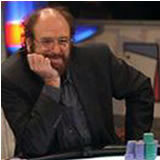 He is regarded as the pioneer in poker game theory, strategy, psychology and statistics. His analytical approach to the game is second to none. He is the author of over a dozen poker books and has contributed too many more. He also has served as a consultant or worked as a manger for numerous brick and mortar casinos and online poker rooms. Being a true intellectual, he founded the Mike Caro University of Poker, Gambling and Life Strategy, which was the world's first permanent poker school. He also was one of the few who believed in the 1990s that real money online poker would not only be successful but would eventually become “bigger than face-to-face casino poker”. However, before this extremely prophetic view of online poker, over 25 years ago, in 1984 at the WSOP he demonstrated Orac (Caro backwards), a poker-playing computer program that he had written. This was the world's first serious attempt at an AI poker player. It was reported that most poker professionals were surprised at how well it played. He continues to write articles, give seminars and even serve as expert witness in poker related court trials. He is regarded by his peers as “one of the best draw players alive”. He is acknowledged as a leader in promoting honesty in gambling. In 1994, Mike Caro received a lifetime achievement award at the Bicycle Club Casino. Many casinos have used his computer research and personal analysis of games, odds, and procedures for nearly 20 years. As of 2007, his total career live tournament winnings exceed $110,000.